India's top court has given Bollywood star Sanjay Dutt more time before he returns to jail for firearms offences at the time of 1993 Mumbai bomb blasts. Supreme Court judges ordered Dutt to surrender in a month after he said work commitments meant he needed more time. Dutt was convicted in 2006 of buying firearms from bombers who attacked Mumbai. He spent 20 months in jail. He was found guilty of illegally possessing a rifle and a pistol but cleared of conspiracy. The son of a Hindu father and a Muslim mother, Dutt said the weapons were necessary in order to defend his family during the Hindu-Muslim rioting of 1993 which followed the destruction by Hindu zealots of the Babri mosque in the northern town of Ayodhya. The Mumbai bombings killed 257 people and wounded 713 others. Last month judges ordered Dutt to surrender by 18 April after reducing his sentence to five years from six. Dutt, 53, had urged the court to allow him to finish work on a number of films before returning to prison. Reports say the actor had told the court that it would take at least six months to complete the films. The judges said on Wednesday that Dutt has to return to prison within four weeks. 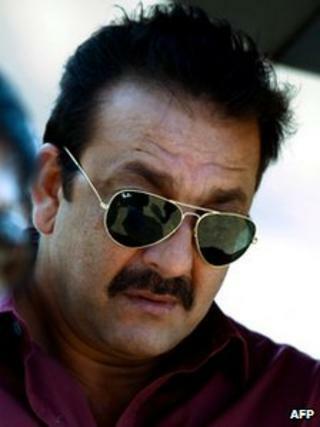 Dutt, one of Bollywood's most bankable stars, is hugely popular for his role as a loveable gangster in the Munnabhai movies. He has also dabbled in politics. In 2006, a special anti-terror court convicted 100 people for the blasts. Twelve were given the death penalty and 20 others sentenced to life imprisonment.